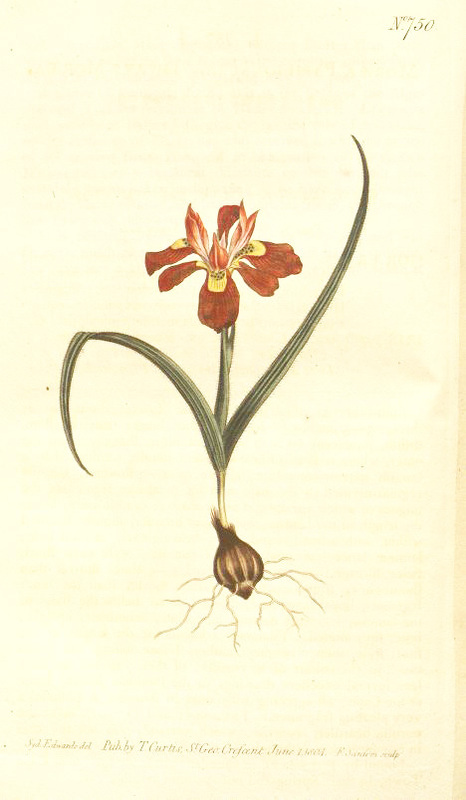 Moraea Papilionacea ((Linneaus' son) John Bellenden Ker Gawler, 1804) in Bot. Mag. 20: t. 750 (1804). Class and Order. Triandria Monogynia. Generic Character.-~-Vid. Net - 593, 613, Sc 695. Specific Character and Synonyms. MORAEA papilionacea (subbarbata) foliis duriusculis, caule simplice longioribus, extus linearis, utrinque pubescentibus ; spatha angustiore longiore ; unguibus laminas lanceolato-ovales et pariter patentes aequantibus, extimis basifoveola melliferainsculptis. G.
IRIS papilionacea. Linn. Suppl. 98. Tbunb. Dijf. n. 37. /. 2. f. 1. prod. 12. Jacq. Coll. Suppl. 159. /. 3. /. 2. Mart. Mill. Dicl. Willd. Sp. PL 1. 238. Bulb-tuber as usual in the genus. Leaves about two or three, 3 — 5 inches in length, rather longer than the stem, stiffish, pubescent on both sides, but more shaggily so on the outer, where it is also lineate. Stem simple, terminated by a longish narrow-convolute fascicle of 2 — 3 flowers. Corolla regular divided to the bafe into fix petal-like fegments ; the ungues of which are upright and converge cyathiformly, about the length of the laminae, outer ones broader, slightly bearded within, with a fmall round honey-bearing cavity at their base; laminge lanceolate oval, equally patent. Style very short, twice shorter than the germen, and 4— -5 times shorter than the ungues ; stigmas petaloid, rather shorter than the inner segments, linear-lanceolate, divided to far below the bases of the laminae, segments narrow, lanceolate, acuminate, upright ; inner lip rounded. Filaments connate for the length of the short style, then diverging ; anthers linear-oblong. It varies much in the colour of its corolla ; of these varieties we have seen several excellent drawings in the Banksian library made at the Cape; all agreeing with ours in stature ; it possesses a very pleafsng fragrance. Thunberg and Jacquin make the corolla beardless (imberbis) which certainly was not the case in our specimen, although this pubescence was very slight. Found by Thunberg in abundance in sandy spots near Cape Town, in their Spring and our Autumn months. G.